Check out the following article published in the New Jersey Hills Newspaper! Advisor Strives To Train Students In Helping Society – New Jersey Hills Newspaper: Observer-Tribune News. MENDHAM – Yale Levey is passionate about helping young people to learn the importance of combining investing and social causes. 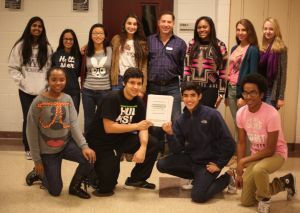 The borough resident and financial advisor and his colleagues have created a non-profit group, Main Street Philanthropy and a curriculum that teaches students the value of philanthropic investing. Levey has brought his program to Franklin High School and hopes to expand to other schools around the area, the state and the nation. The curriculum is being supported by a $10,000 grant from Christopher Johnson of Mendham and his company, Hollister Construction Services. As part of their obligation to the program, participating students also will raise $1,000 to provide to charitable organization they have vetted. Classes run for one hour, once a week. By the end of the 10-week program, students will give out most of the money to charitable groups they have chosen. “We’re breeding philanthropists in training,” said Levey. The goal of the program is to create a real-world experience in charitable giving and fundraising. Through the program, students will meet in small groups along with their teacher, Ron Richter and with Levey, who calls himself a Main Street Philanthropy Ambassador. The group also will meet with donors and charities which would benefit from the collaboration. Using the donated funds and money they raise themselves, students will identify local charities whose missions align with the students’ charitable passions. Working in small groups, they will examine the organizations’ tax returns and evaluate their effectiveness in accomplishing their charitable purposes. They will interview officers and board members and then decide which organizations are having the greatest impact. Eventually, they will deliver checks to those charities that the students decide are doing the best job in the community. The program was launched on Nov. `13 as part of Richter’s business psychology class. Raised in Short Hills, Levey said he spent many years as a wealth management advisor. Sometime in 2004, he said he was speaking about charitable planning with his brother, Greg. It was an “epiphany” when Levey thought about how basic financial planning could be combined with charitable planning. “I discovered that a very, very small group of planners had the same idea,” Levey said. He soon became involved with the International Association of Advisors in Philanthropy and in 2006 was asked to join the board. He was later named its marketing director. “True wealth is your money but it’s also in relationships, heritage, intellect and the causes I stand for,” Levey said. Levey said he works with several other partners to provide advice to affluent families. The program begins with an assessment of the students’ awareness and an explanation of the many charitable causes. Students with like passions then pair up and write regular blogs about the program. They then get together in larger groups and talk about their lives and families. “We discover we are a lot more alike than different,´” Levey said. Levey is not being paid for running the high school program but is launching a home version of the curriculum for families and to license the curriculum and train others as leaders. Levey and his wife, Donna, have a son, Gabe, 11, and daughter, Olivia, 10.